The MAKERwatch, beta testers wanted! Actually, this combined with @Lisamith suggestion of a desk clock.... that's my next project!!! Cheers guys! I’ll be a beta tester for you. Sure. What do I need from me to proceed forward? I like the look of the watch but wouldn’t want to wear it due to the size. Rather, I’d use it as a kitchen clock/timer (if it had a magnetic bar on the back) or as a desk clock (if it had a simple mechanism to prop it up) or as a wearable badge clock (if it had a clip or perhaps a chain). I’d love to beta test if you still need help on that front. I would love to Beta Test this watch. If you still looking for beta testers, I want to be one of them! I’d most definitely be interested in beta testing! 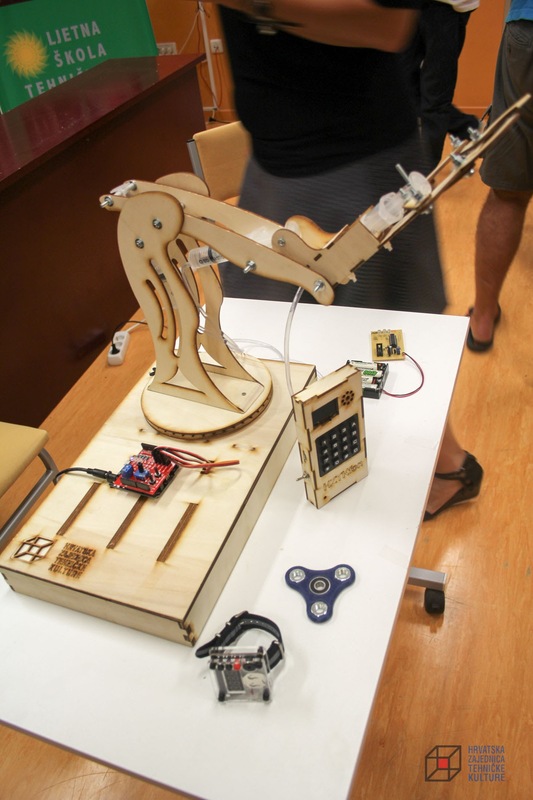 It looks cool, but what can it actually do? It can show time (or other 4 digits information) and buzz. I would love to be a beta tester!!! I m interested too in beta testing. Any news on the beta tests? Have you chosen anyone? Timeline? They just managed to keep up with the Kickstarter campaign, I think they need a rest before starting a new project. This old post is getting lots of comments and no replies from my side and I am sorry for that. I’ve limited my time and energy to the support section of the community forum lately because it was our no. 1 priority and I was struggling with finding enough time to cover all the other posts you folks were making on the forum (A lot of things had happened lately and you know that already - registering the company, dropping out of college, moving the company to a bigger workplace etc.). The story about this watch didn’t stop at that prototype. 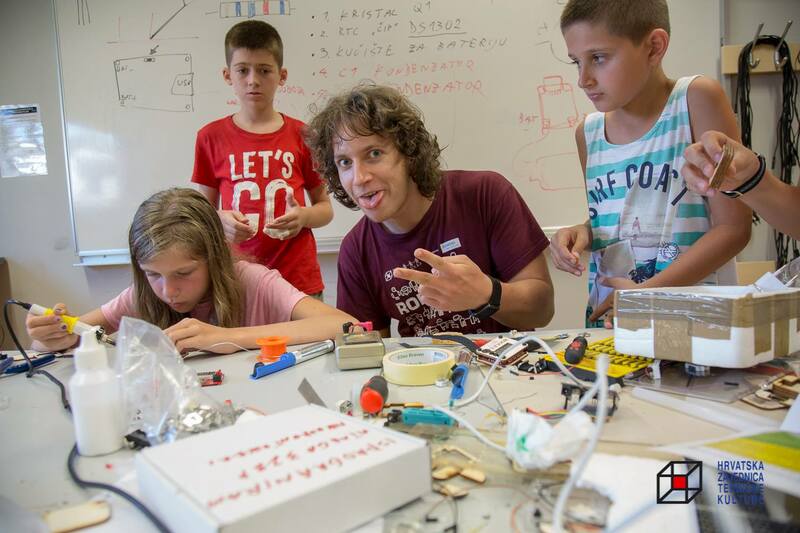 In fact, the watch was designed for a soldering workshop that was held on a Maker summer camp in a Kraljevica - a coastal city in Croatia where there is a maker-culture center partly financed by the government. Why was I doing this in this super-busy and stressful time of the year and didn’t focus on the MAKERbuino and other important stuff - because I’ve promised them to design a simple kit and organize workshops almost 8 months before and they didn’t have anyone else to do that job instead of me when I tried to cancel the workshops. 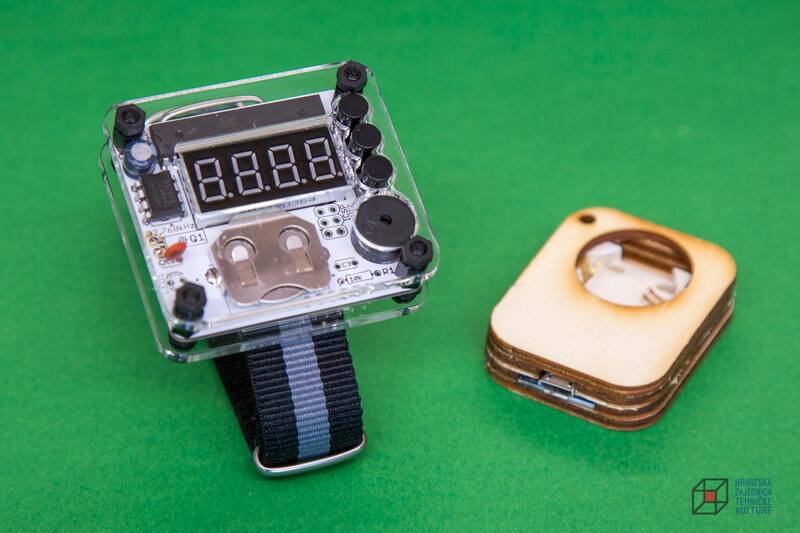 Anyways, the watch was successfully soldered by 120 primary school children and despite me being super-late with everything (not just with MAKERbuino-related things) and totally stressed out, everything turned out quite nicely. You can see from the pictures above that the kids were also making this tiny wooden box with a round opening. That is a LIR2032 battery charger they were also assembling. Yes, the watches came with a rechargeable battery and a charger for the battery because the LED’s drain the watch’s battery pretty quickly (you can check the time for approx. 200 - 250 time and that was enough for 2 days of power-on time for some users that were clicking their watches every 10 minutes). 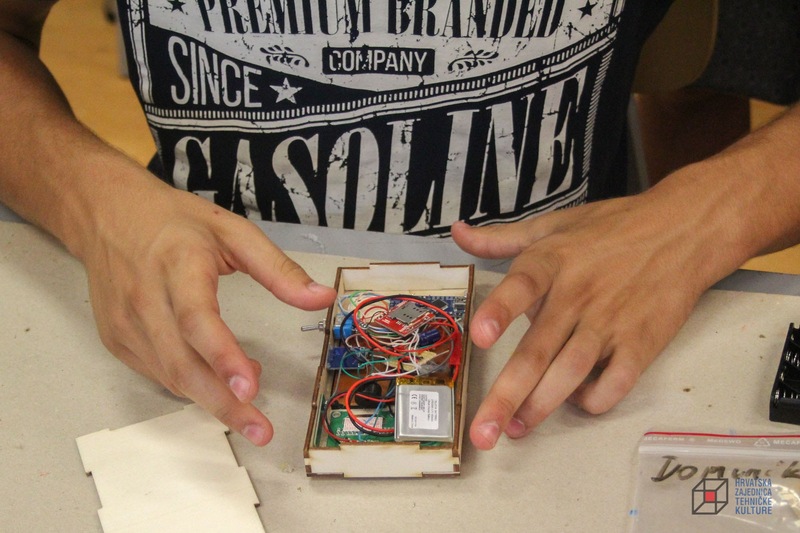 And there was also a group of 20 high-schoolers that had to make a special project. 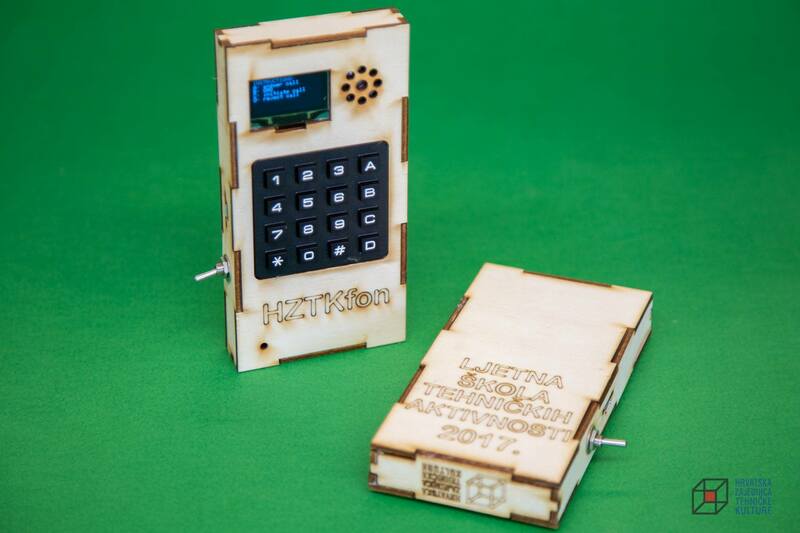 That special project was the MAKERphone - a fully functional mobile phone I was building with the high-schoolers. It doesn’t even have a PCB, MAKERphone is just a bunch of modules inside a wooden box, but it works! It can actually make and receive phone calls. Last year I was also in charge of a soldering/coding workshop where I was making self-balancing robots with 20 high-schoolers. I do realize that this is not a super-original or super-complicated project. 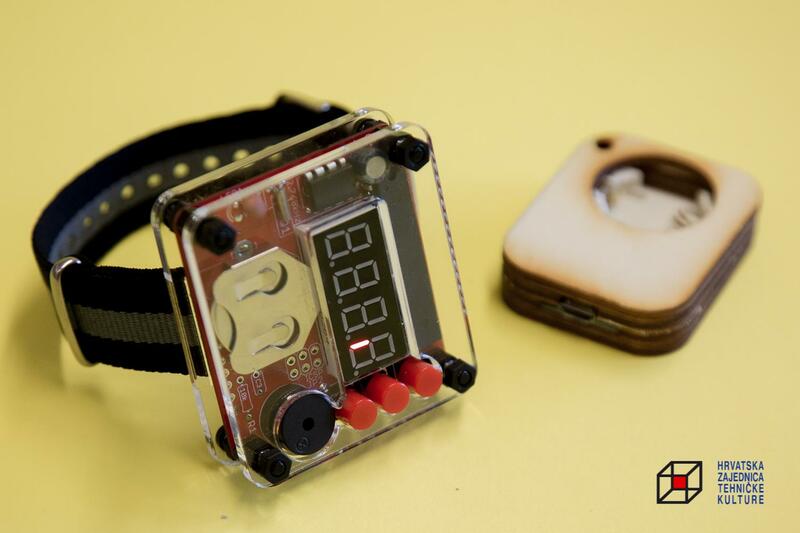 It was designed with a purpose of making a simple soldering kit for children, learners, and tinkerers to learn to solder whilst still having a final product that has an actual purpose - showing time. I’ve got approx. 80 MAKERwatch kits left from the workshops and will soon put them in the shop where you’ll be able to get them, test them and tell me what you think. You will be notified first when that happens. 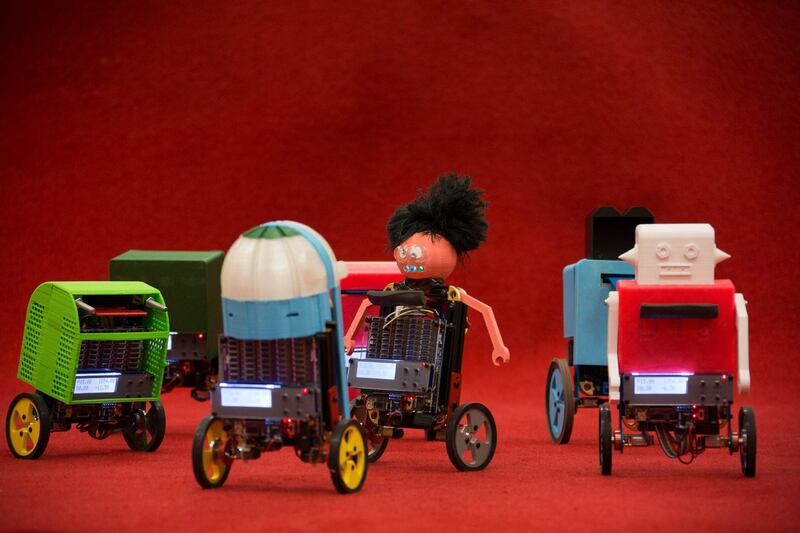 MAKERbuino is still our no. 1 priority and takes most of my (our) time and still needs lots of work and improvements, especially regarding the documentation and tutorials. Tell me what you folks think! 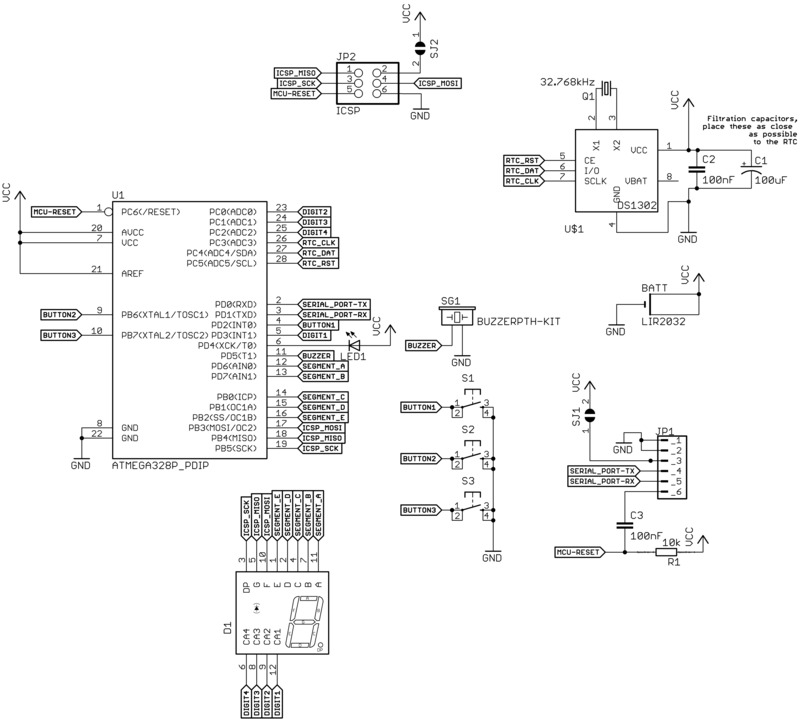 When the MakerWatch becomes available, I would love to beta test it and try and make things like stopwatches. I would love to help you make it a viable product! Cool. Also, if you need beta testers for any of the other devices, I would love to try them out and help you build a better business. Thank you, I am really grateful for your offer and interest. I will keep everyone posted about the news here. Wonderful,Would love to be a beta tester!! Please include me! I will gladly pay for kit and shipping to China!